***** DISH OF THE WEEK (Sunday- 3/14/18- UTZ Gourmet Caramel Popcorn Clusters). If you’re a fan of caramel popcorn- the bet here is that you’re really gonna enjoy UTZ’s Caramel Popcorn Clusters. Jeff Eats discovered them a few days ago at the Target located at 21637 SR 7, Boca Raton, FL 33428- (561) 483-3400 and I gotta tell you guys that the clusters were absolutely delicious! If you “search” you will find that UTZ products are literally retailed by a million different stores/chains- including Bed Bath & Beyond, Target and Walmart. 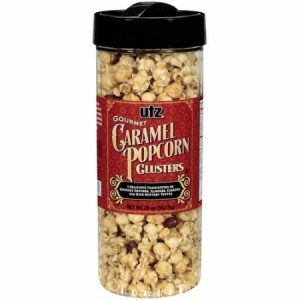 As previously mentioned, the pictured 20oz popcorn canister was purchased at Target- UTZ also makes a 19oz canister of UTZ Gourmet Caramel Popcorn Clusters (which is identical in looks to its 20oz canister) so be sure to check oz/price and then do the math!